Christchurch is the biggest city of the South Island, and the second largest city in New Zealand. The town remains famous for its cathedral, beautiful gardens and parks, museums, restaurants and night life. Cultural and adventure activities in and around Christchurch are numerous. Christchurch offers a unique blend of historical charm and vibrant city life. The international airport in Christchurch makes it a great entry point or base to explore the rest of the Canterbury region and South Island. 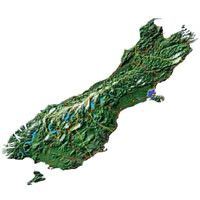 Following the earthquake of 22 February 2011, our thoughts are with the people of Christchurch, Canterbury and New Zealand and we believe in the continuity of New Zealand to offer its inhabitants and tourists a palette of natural, multiple, varied and unique resources. Cycle New Zealand offer on & off-road bicycle tours in the south island. Small group escorted tours with vehicle support. We use local guides with a love of NZ food & fine wines. Long & short term mountain/ touring bike rentals also available. Adrenalin Forest is best described as a multi level aerial obstacle course. Participants negotiate a series of rope bridges, Tarzan swings and flying foxes from platforms in the tree canopy. The park features a course up to 17 meters off the ground. Participants attached by an overhead safety wire safely negotiate a series of 60 challenging activities on 4 pathways of increasing difficulty. Do come along all you Jazz Lovers and sit and enjoy Sweet Liquorice plus great food. Find South Indian street food Dosa at The Arts Center Market. Dosa is a thin rice and lentil pank cake, it has different fillings. Dosa serves with Coconut Chutne, Red Cheese and Lentil stew(sambar) #Glutenfree #Vegiterian.